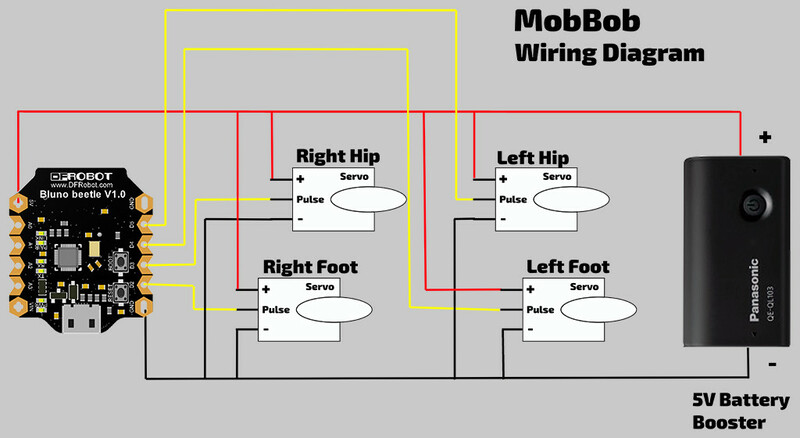 A few people from Thingiverse have been asking how to wire up MobBob. So, I made a diagram. Let me know if you have any questions or hit any problems. After hearing from a few people, there is one thing I should clarify about the diagram! The positions of the wires in the diagram are not the positions they are coming out of the servo! The red wire is usually the “+” wire, and is usually the centre wire. The yellow (not always yellow!) wire is the “pulse” wire, and is one of the side wires. The black (or often brown) wire is the “-” wire. Previous PostSphero Companion Updated!Next PostMobBob app is now on Google Play! Perfect!! Just that I need!! For the Wiring did you have to solder all the + wires together before connecting to the Bluno Beetle? Also do you have any instructions for the wiring using a Bluno Nano? Thanks amazing work, Cant wait to get my Mobbob working. All the best with your build! Essentially, all the + wires do end up connecting together. Maybe think about it like this. All the servo + wires draw power from the +ve terminal on the battery. The Bluno’s +5V connection also needs to draw power from the battery +ve terminal. The wiring on the Nano is basically the same. You can connect to the digital pins that have the same labels on the Nano. I’ll add a diagram of this on the weekend. Thanks for posting, and I’ll add more information soon. I just posted about using a breadboard for connecting the servos. This is what I did with my original build of MobBob. It might be useful to try doing that before soldering everything. With the Bluno Nano, you can fit it on a small breadboard easily! All the best, and let me know how you go! Thanks Kevin I will take a look and see how you did it, I tried loading the code and running it by soldering all the + wires with the + of the battery and then had a cable running from that bunch to the bread board, but when I tried running tests from the serial monitor it would’nt respond, also had issues with connecting to the app. Ill give it a go tomorrow and see what I did wrong. Thanks again ill keep you posted on my build. I might have a few more questions, thanks again for the response. If possible try running the software with the Serial Monitor without the servos connected to see if that works. Also confirm the Serial Monitor has the same Serial speed as the code. I’m working on MobBob app updates. Another update on Tim Harvey’s Blockly app. Andi on I’m working on MobBob app updates.